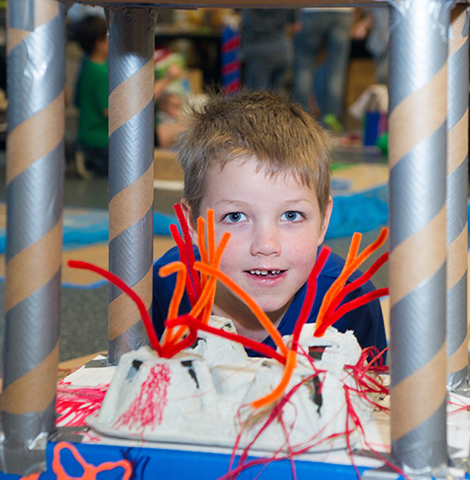 Join us as hundreds of kids, parents and expert mentors design and build the most amazing city! Kids from all over town are invited to spend the day building the city! Saturday morning, as kids arrive for this huge event, they will “apply” for a building permit, be issued a “plot of land” and receive mountains of recycled materials and art supplies. Then, they can spend as long as they like building their dream city. This is the Seventh Annual City Imagineerium build. Last year, over 300 people participated in the build. To see a video recap of a build day, visit http://www.youtube.com/watch?v=nPiM5ToE6PE. As you will soon see, kids create the most amazing cities - eco-friendly, beautiful and fun to live in. So, it’s no surprise that the volunteer city planners, architects, builders and engineers who have been on hand to help the kids say they have learned as much from the kids as the kids have learned from them. We know that this year, the kids will just keep “wow’ing” us! We spice up City Imagineerium each year with special building challenges. This year, the them is "Futuristic City." We invite our young architects, builders and city planners to create the most forward-thinking buildings, power plants, highways and other city structures they can imagine. We will announce special, themed building challenges each hour, spurring the kids to even greater heights of imagination. And, of course, there will be prizes to recognize their flights of fancy. Our wonderful sponsor makes this event possible. UMKC’s School of Engineering and Computing provides space and volunteers. Our thanks to everyone involved! Online registration is now closed so that our team can prepare for the event; you are, however, very welcome to register at the door throughout the event.